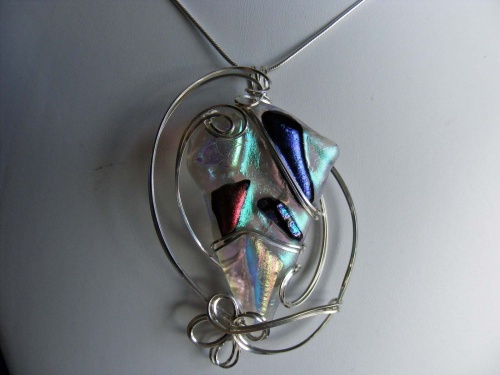 This feel good piece is sculpted in sterling silver swirls enhancing the milky white glass with aurora bourialis colors abounding over the white and also some dark blue pieces and a rust colored piece on the surface to make this piece truly unique. This will match any outfit. Measures 2 1/2 long by 1 3/4" wide and comes with a sterling silver chain.